I feel nothing. Nothing at all. I haven’t added a book there in over a month, I have made less than five friends, started a group that I quickly neglected, and only bothered to visit my account last night to do research for this post. 1 – I’m freaking busy, that’s why. 2 – I’m in a vacuum (not really, but will address that later in this post). “You’re in a vaccum? What are you talking about?” I mean in the context of my off and online life, LibraryThing (currently) places me in a silent abyss void of interaction. None of my real friends are on LibraryThing, even my most nerdiest of nerdonians. They are too busy actually reading books, and fine tuning their own mystical personal archiving processes. So, even ignoring those tome-orgian extremists, the rest of my mostly literate social sphere also missed the boat on LibaryThing. Why? I’ll tell you why. They found Visual Bookshelf through Facebook and went bananas. Don’t get me wrong – I love LibraryThing even though I rarely use it anymore. It is such a great community filled with passionate users, and even offers the ability to import/expert as csv your ISBN numbers from other collections. I know this because I used this feature to import most of my LibraryThing catalog into Visual Bookshelf (Doh!). The version above allows you to display your collection based on the settings in the tool feature on LibraryThing. The display links to your entire library… and that’s it. The second version, below, does pretty much the same thing only with text. – Reading now/already read/want to read options (LibraryThing – Does not have this feature and in order to refresh your LibraryThing app display you must update it from within the app home page (more work, ugh). it counts on your friends to leave their primary social networking experience, to create an account, and it’s limited Facebook App does little in the way of integrating both experiences. I am sure there are business/political reasons as to why LibraryThing hasn’t busted out with a more competitive Facebook App to give Visual Bookshelf a run for its money. In this LibraryThing topic thread, it’s clear that there are many LT users who are also on Facebook, and who desire a more robust app. Until that happens, die hard LT/Facebook users will continue to import their collections into Visual Bookshelf and other cataloging apps, but for how long? Why continue to send business to Visual Bookshelf, LibraryThing? With such impressive search power and professional tools, why the delay in updating your Facebook App? Until I am given a reason not to, I think I am going to continue updating Visual Bookshelf and neglecting LibraryThing. Great post. I have a few hundred books on LibraryThing, so thanks for the tip about exporting in .csv in order to load the Visual Bookshelf. I’d be curious to hear your perspective on Anobii – how about a LibraryThing vs. Anobii post? When you’re not freaking busy, of course. Terrific analysis. 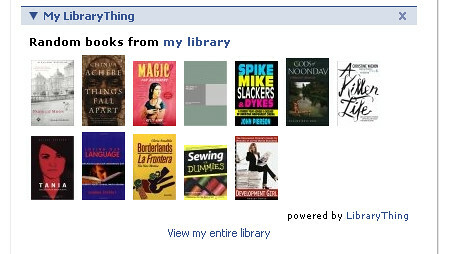 I’ve been on LibraryThing for a year, but I am going to keep exploring all the options before making up my mind. Another post mentioned Books iRead as another Facebook alternative. Also, since music and movies don’t do it for me, I feel like Visual Bookshelf would divert attention from my true mission, to share what I am reading with friends. I also would like to be able to include my reviews, something apparently not possible with Visual Bookshelf. Visual Bookshelf does allow you to include your reviews, and reminds you when you are “due” to review an addition. You can also leaves comments on the book’s main page and view others who have added it to their bookshelf, along with all related reviews including your own. I think I’m going to have to write a blog entry comparing all known book cataloging sites/tools and their respective social networking features or lack of…. When I have some free time. Later. Maybe. I don’t know – I tried to import my librarything books into visual bookshelf as a .csv and it crashed – five times! It doesn’t seem able to import more then 10 books at a time. Visual bookshelf, like most facebook applications, seems useful as a novelty the first time you spot a friend using it, but breaks down once you ask it to really work as an application. Useful information, thanks. I was hoping there was finally a decent LT->FB app, but alas, alas. I guess I’ll go with VBS. I signed up for LT and Goodreads about the same time. I haven’t tried VB. Even though GR uses the same Amazon search as VB and lacks the search power of LT, you can establish an unlimited number of shelves and populate them using a drop-down menu. With LT, you have to add the tags each time. GR shows two books on FB on two shelves – Currently Reading and Read, so not as versatile as VB. 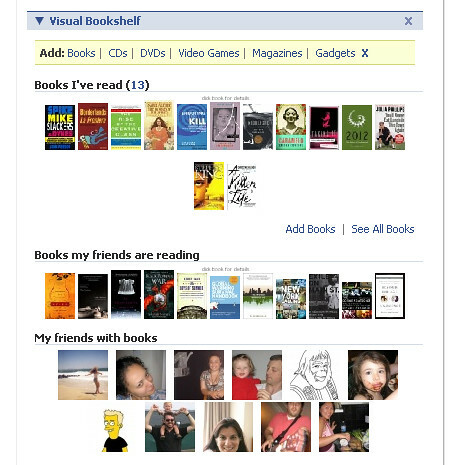 The problem I have is that roughly half my friends use Visual Bookshelf, and the other half use the Books application on Facebook. Neither seem particularly better in usability either. If only one would buy out the other and merge! Visual Bookshelf has stopped importing Lib Thing data. I thought I’d give them a whirl having read your review. I found the page where their import box HAD BEEN, but it ain’t there no mo’. Subsequently I plodded through their help system which is a bit of a modern marketing web 2.o house of horrors (you have to sign up to a seperate service, and they rate the likelihood of your ticket getting answered on whether you’ve chosen a nice picture to go on your query and a nice emoticon for how happy/frustrated you are with the whole Orwellian pipeline they’ve got you working just to get a question answered. It was the help system that really made me abandon the chase. Plus they kept the sign up data that got me that far,with no option to delete. (Can’t find that on LT either, to be fair). They need their hands smacked for being annoying and wasting 1/2 an hour of my time. When do you think they’ll send me my first friendly survey to ping the email I supplied? Urgh.